Marva Collins offers a beacon of hope in the midst of America’s educational crises. In this work, Marva Collins recounts her successful teaching strategies and offers inspirational advice on how to motivate children to fulfill their potential. This 1990 updated edition contains a new epilogue for parents and teachers. Teachers need nothing more than “books, a blackboard, and a pair of legs that will last the day,” Marva Collins told Dan Hurley in 50 Plus magazine. These three things were essentially all that Collins had when she opened the Westside Preparatory School in Chicago, Illinois, in 1975 with the $5,000 she had contributed to her pension fund. Disillusioned after teaching in the public school system for 16 years, Collins decided to leave and open a school that would welcome students who had been rejected by other schools and labeled disruptive and “unteachable.” She had seen too many children pass through an ineffective school system in which they were given impersonal teachers, some of whom came to school chemically impaired. A firm believer in the value of a teacher’s time spent with a student, Collins rejected the notion that the way to solve the problems faced by U.S. schools was to spend more money. Collins also shunned the audiovisual aids so common in other classrooms because she believed that they created an unnecessary distance between the teacher and the student. By offering a plethora of individual attention tempered with strict discipline and a focus on reading skills, Collins was able to raise the test scores of many students, who in turn went on to college and excelled. Marva Collins has received many accolades in recognition of her outstanding work with children. She was featured on Good Morning, America, 20/20, Fox News, and many more programs. A made-for-television movie titled, The Marva Collins Story starred Cicely Tyson and Morgan Freeman first aired in 1982, and is still presented on television. To say critical is to understate how poorly most of our public education is serving our youth today. Indeed time and again in starkly clinical appraisal, our captains of industry have warned our sources of education that unless the U.S. produces higher-level graduates, American industry inevitably will be thrust into further jeopardy. They point out that today we confront a competition that is better motivated, better trained, and smarter than we have ever met before. Moreover, this need breed of competitor nation makes it their governmental policy to maintain their educational standards in pursuit of greater excellence. 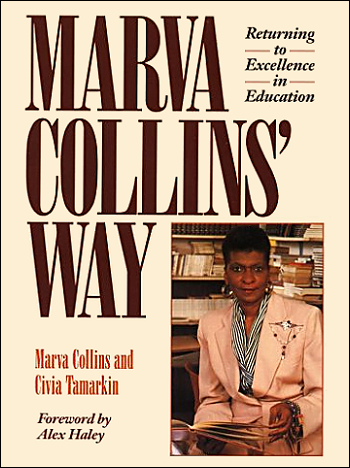 It is against this background that this book presents Marva Collins, whose opinions of what is and is not effective teaching afford us a palette of insights into why she must be regarded among America’s foremost educators. Surely, no other secondary school principal ever has been offered the post of Secretary of Education by two consecutive U.S. Presidents. Marva Collins turned down both of these offers, preferring to remain her own woman, unencumbered by politics and bureaucracy, as the founder and the principal of the Westside Preparatory School. The challenge that motivates Marva Collins is to prove that something positive and constructive can be done about the deplorable rate of dropouts, which is preceded by an attendant level of scholarship among most minority youth. But the inadequacy of U.S. public education of minorities is scarcely less than the inadequacy of public education in general. Even the most elite schools of higher-education perennially cry out against the poor quality of students of all ethnic descriptions who apply for entrance. A chilling statistic recently reported by American industries states that over 30 percent of their job applicants must be rejected because they are not able to fill out the application form properly. The results achieved by Mara Collins’ students are even more dramatic than her challenge. Since she began her school fifteen year ago, every one of that grammar school’s graduates is today either attending some outstanding prep school on full academic scholarship, or has gone on to an outstanding college or university. These are young Americans who without such schooling likely would have drifted into the surrounding world of drop-outs, public assistance, and addiction. Little wonder that education administrators from around the world travel to Chicago to visit an inner-city school and expose themselves to the program developed by a dedicated and committed teacher and principal who is doing her utmost to offer something new to education. What Marva Collins thrusts into the minds of her students is that whomever they are, and wherever they live, they can achieve quite literally whatever they can dream—no matter what anyone else may say to the contrary. Why is this book by Marva Collins so important? It is because this book represents her life, her convictions, and her work. Indeed, America would be indefinitely better served if Marva Collins’ philosophy of education somehow could become franchised and implemented on a national scale. ~ Alex Haley, June 14, 1990.